I'm not really sure why the book has this title. Sure, he mentions goats and he mentions loquat trees. I think the title is supposed to be the thing that intrigues you enough to want to read the book. It worked too because it was the title that gave me interest. So there! Ha! 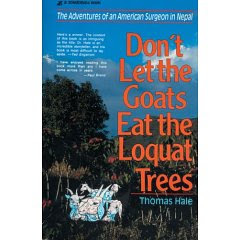 This book is written by an American surgeon, Dr. Thomas Hale, who takes his family to Nepal to serve on the mission field. Thomas' wife is a pediatrician so the two good doctors took their two good sons and embarked on an adventure to serve the Nepali in their native land. Only you don't really get to hear about the family. And you really don't get to hear about any missionary work. It's mostly about the surgeries that he performed during his time in Nepal. Ok, so by that you should gather that I wasn't altogether fond of this book. Sure, I found the surgery stories in primitive areas interesting. (The only medical procedure that forced me to skim the page was a tooth pulling. I have a dreadful fear of dentists.) Yes, Dr. Thomas Hale and fam are Christians but his apparent doubt that God could heal a person and/or turn a situation around was almost frightening. No, I take it back. It IS frightening. He admits that scientific evidence and what he knows about the way the body function leads him to doubt. He seems to focus more on how other people prayed for his patients and failed to relate his own belief in God's ability to heal. Quite frankly, he made me feel very distrustful towards doctors. He seemed the type that doesn't really want to deliver bad news and so he reassures his patients, even when he knows that they are tottering on the brink of death. I don't admire that. Nor do I admire the fact that he didn't seem to really try to share the Gospel message with those that he knew were dying. Now, he did have to make an agreement not to proselytize with the local government. If you want to argue that. Which I don't. God did some amazing things through Hale's ministry and those stories were interesting to hear of. However, I finished this book feeling a bit miffed and dissatisfied. God is so much bigger and can do so much more than Hale would suggest. I found his lack of faith both honest and disheartening. It IS an interesting and thought-provoking book. Our ladies' book club at church read this book for our March meeting and I'm looking forward to discussing it with them. I have a lot to say and I suspect that the other readers do also. This book is good. Go read it. But think big. Because God IS big. I really enjoyed your review! Sounds like your book group might have a lively discussion if you turn up and say what's on your mind! This sounds like an engaging (if somewhat irritating) book. I think God isn't threatened by our honest questions, and even welcomes them. But perpetual equivocation--using questions as a way of preserving control--is a qualitatively different thing. This book sounds like it gets one thinking about the difference. Thanks for this great review.